February 26, 2013 meeting of food manufacturers. Image Courtesy: Brooklyn Chamber of Commerce. Work space, affordable insurance, and information access among chief concerns of small Brooklyn food and beverage manufacturers. On February 26, 2013, the Brooklyn Chamber of Commerce and Council Member Stephen Levin hosted an event for local food and beverage manufacturing businesses at the Wythe Hotel in Williamsburg, Brooklyn. The organizers sought to give Brooklyn entrepreneurs a chance to raise issues related to starting and growing a successful food-based small business. Organizers hoped to take the ideas generated from the event and help make Brooklyn a top food manufacturing industry location. Over 70 attendees participated in the event, which also provided small businesses an opportunity to network and showcase their products. Attendees sat at 10-person tables and were encouraged to talk through the common pitfalls and problems of starting and maintaining a food manufacturing business in Brooklyn, as well as brainstorm solutions. Attendees were instructed to present the highlights of the small group sessions with the rest of the room at the end of the meeting. Attendees represented a wide variety of experience and products, such as Salty Road, a salt water taffy maker; The Brooklyn Kitchen, a Williamsburg kitchen supply store and educational facility; Industry City Distillery, a Sunset Park vodka distillery; and the Coalition for the Improvement of Bedford-Stuyvesant, an organization focused on the economic and social advancement of the Bed-Stuy community. The main issue of the night, shared by most food businesses, concerned space to either start or grow production. Start-up businesses were looking for incubators – small, commercial kitchens for rent – to legally produce food products. Small, established businesses were looking for co-packing facilities – high volume food manufacturing and packaging plants – to expand into wider market distribution. Location, price, and capacity are issues for both incubators and co-packing services; most Brooklyn businesses want to stay local but have difficulty finding facilities that fit their small manufacturing needs. Businesses are forced to look outside of Brooklyn as well as outside of the state to find adequate facilities. Attendees suggested a government-run co-packing and kitchen facility that could accommodate a variety of foods and volumes. Affordable insurance was also a big issue of the event, whether for employees and worker’s compensation, credit, liability, or commercial vehicles. Council Member Levin informed the audience that although insurance is mostly a state issue, he would work with the State Assembly on addressing their concerns. Many attendees also expressed frustration with access to information. Small food manufacturers face a seemingly unlimited web of issues, including City, State, and Federal regulations and requirements, funding resources, facility directories, and workforce development and management. Attendees suggested one central hub – either a dedicated government agency or a non-profit organization – where small businesses can access relevant food manufacturing information. The evening ended with an exchange of business cards amongst attendees and a general hopefulness that their concerns and ideas would be addressed, either by cooperation between the businesses or with the help of elected representatives. 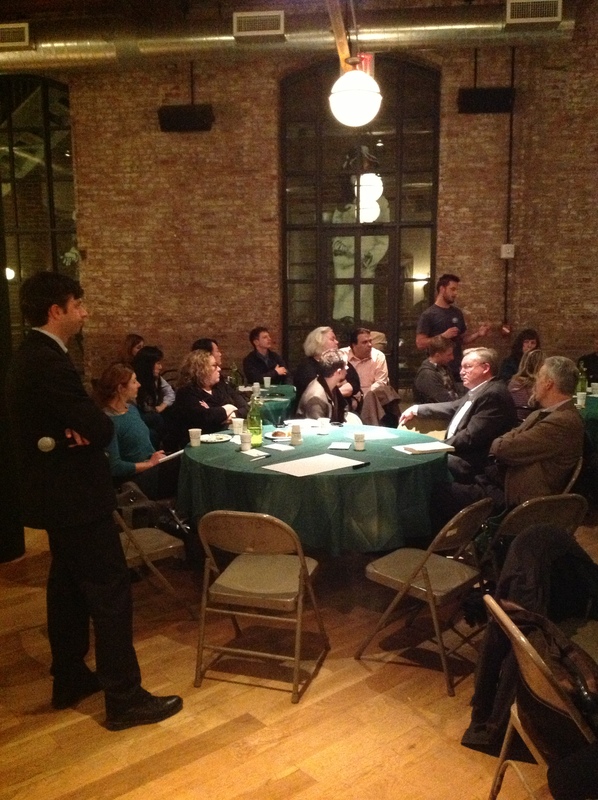 Brooklyn Chamber of Commerce: Food Industry Community Meeting (February 26, 2013).